Vacherin is a cow's milk cheese. Two main types of French or Swiss Vacherin cheeses exist. One type of Vacherin cheese is called Mont d'Or, or Vacherin du Haut-Doubs, from France, or Vacherin Mont d'Or from Switzerland (though it tends to just be called Vacherin in the local shops). 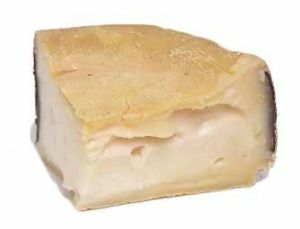 It is a soft, rich, seasonal cheese made from cow's milk in Switzerland or France, usually in villages of the Jura region, and has a grayish-yellow washed rind. It typically contains 45 to 50 percent milk fat (in dry matter), and is produced between August 15 and March 15, and sold between September 10 and May 10. The Swiss Vacherin Mont d'Or is generally made with pasteurised milk, while the French Vacherin du Haut-Doubs is unpasteurised. It is traditionally made in the winter months when the cows come down from Alpage and there is not enough milk to make Comte. It is marketed in round boxes of various diameters made of spruce. It is often served warmed in its original packaging and eaten like fondue. Vacherin d'alpage is made from the milk of cows pasturing in alpine meadows and hence has a much richer taste. The older the vacherin gets, the stronger the smell of ammonia due to microorganism activity in the cheese. Recipe Using Vacherin Link1, Link2.